-The vitals: Extras were Sheldon Rempal, Kevin Gravel and Daniel Brickley. Muzzin (upper-body) took the ice and handled a few pucks after the skate concluded. Torrey Mitchell (illness), Alex Iafallo (upper-body) and Derek Forbort (lower-body) did not skate. On the flu bug that has passed through the room this week, John Stevens said “It’s made its way around, but I think it’s on its way out. It worries you a little bit, because it kind of catches you by surprise. But, I think we’ve got a good handle on it.” Jonathan Quick left the ice first and is expected to start in goal. He’s 17-9-2 with a 2.39 goals-against average, a .916 save percentage and two shutouts in 28 career games against Dallas. -A Go Fund Me page has been established to assist the families who’ve lost loved ones in the tragic Humboldt Broncos bus crash. Click here to donate. -Players who, barring anything unforeseen, will play in all 82 games this season: Drew Doughty, Anze Kopitar, Tanner Pearson and Tyler Toffoli. Doughty is expected to play in his 328th consecutive game – the club’s record is 330, set by Anze Kopitar between March 21, 2007 and March 26, 2011 – while Pearson is expected to play in his 162nd straight, Kopitar his 120th and Toffoli his 113th. It’s not too different of a scenario he’s currently experiencing. Amadio, who is expected to play in his 37th game as an NHL rookie tonight, was inserted back into the lineup by John Stevens last Friday in Anaheim, and if he remains on the lineup card when the playoffs begin next week, the team will have full confidence in his ability. The larger picture never overwhelmed him when he debuted in the AHL postseason or when he had scored 50 goals for the OHL’s North Bay Battallion earlier that season. That focused mindset – and the defensive wherewithal that serves as the lifeblood of any coaching staff’s faith – will help him avoid becoming starry-eyed when he gets his first taste of the Stanley Cup Playoffs. -More LAKI soccer coverage: Oscar Fantenberg, of Ljungby, Sweden, is an Arsenal supporter. 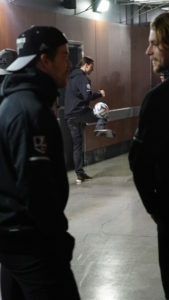 He also keeps close tabs on the Swedish national team, which made his pre-game meet, greet and warm-up soccer game with Swedish legend Zlatan Ibrahimovic a once-in-a-lifetime experience. 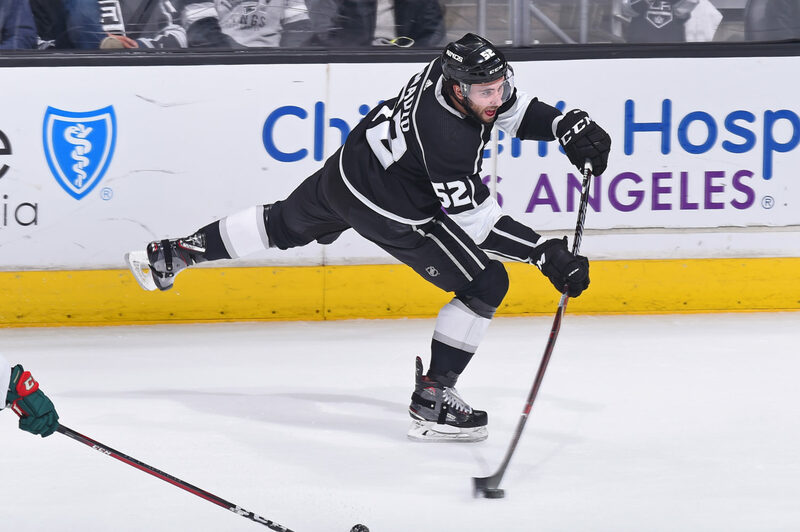 Fantenberg, who was told by Reign coach Mike Stothers after practice Thursday morning that he’d be called up to the Kings, had to make adjustments in jumping from his more familiar 12-to-15 minutes with Los Angeles to being an ice time leader in Ontario. After recording two goals and nine points in 26 games with Los Angeles he totaled one goal and 13 points in 25 games with Ontario and was able to provide ample dividend from his skill set as the season progressed. With injuries to left-shooting defensemen Jake Muzzin and Derek Forbort, Fantenberg will get an opportunity to show how he can handle playing key minutes against top players alongside Drew Doughty and could be in the mix for a similar role once the postseason opens next week. That the team has similar faith isn’t lost on the 26-year-old defenseman. Yeah it’s definitely looking up, looking on the upside. Some of our young guys have been amazing. A.I. coming in undrafted—great job by him. Kempe, he’s going to be a stud in this league. He’s going to be really, really good. We’ve got some other guys too obviously on the back end that have stepped up and played great for us. As a whole, it’s really looking promising. We always do a good job at developing guys in the AHL and that’s why they’re so successful and they get the call. -Tonight’s officials are referees Francis Charron and Chris Lee and linesmen Ryan Daisy and Pierre Racicot. Gavin Stevens will perform the national anthem. Lots more to come from Staples Center, Insiders. Let’s talk soon.